Contemporary architecture is preoccupied with radical formal experimentation, enabled in particular by the computer and computer-controlled machines. Such ambitious architectural form-making requires a virtuosic mastery of spatial geometry, a specific kind of design knowledge that is often specialized and difficult to deploy. Machines, including computers, provide a way of encapsulating this knowledge in a more usable and repeatable way. Such machines raise certain epistemic challenges: they abstract systems and detach the user from operative logic, requiring more instrumental and less design knowledge from the user. While contemporary architects are increasingly testing the relationship of design knowledge to instrumental knowledge, we may draw lessons from the broad use of mechanical drawing instruments for design and design-based computation in the nineteenth century. In this historical context we can see key relationships between instrumental knowledge and design knowledge that are fundamental to understanding our own increasingly mechanized approach to contemporary design. 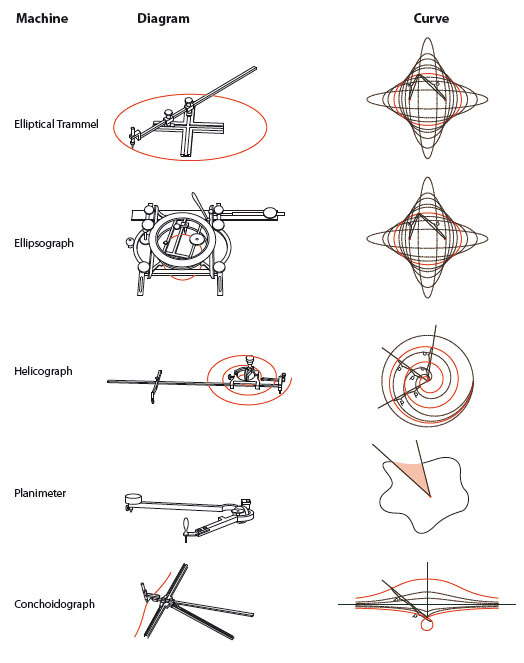 Selected drawing instruments for the construction of complex curves.